This wood-styled recycled material picnic table offers a low maintenance, weather resistant seating solution, ideal for campsites, parks, nature reserves and outdoor recreational / leisure environments. It is easy to clean by wiping with a wet cloth or Glasdon Graffiti Wipes. Clifton Picnic Table is attractive and functional, and will withstand heavy use in any outdoor environment. 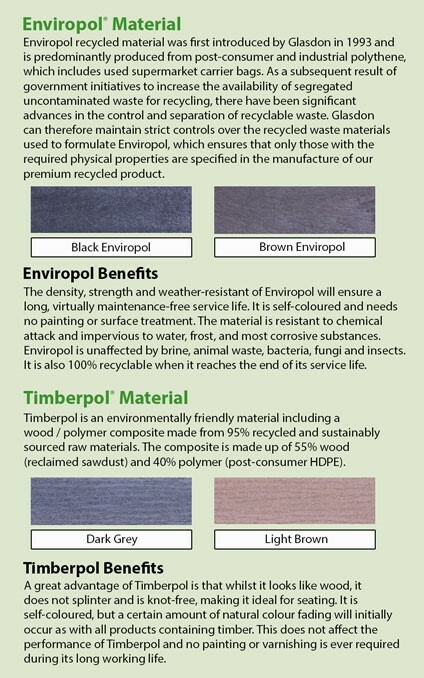 The table can be left free standing or securely fixed to the ground, and is available with a choice of Brown or Black Enviropol® Material, or an Enviropol Material frame with Timberpol® Material slats. Minimum maintenance - needs no surface treatment. Craigtoun Country Park is located on the outskirts of the world’s renowned home of golf, St. Andrews. In preparation for the busy summer ahead, Glasdon were selected to supply seating solutions for a number of areas within the park estate. Beautiful Pembrokeshire in west Wales was the centre of the Celtic kingdom of Dyfed until Norman settlers built Pembroke Castle in 1093. Nell Bank in Ilkley near Bradford provides day and residential experiences for schools and community groups across the full age and ability range. The centre is run by a charitable trust and has won awards for its activities and inclusive facilities.